Edith grows up in her big sister Vivienne's shadow. While the beautiful Viv is forced by the girls' overbearing mother to compete in child beauty pageants, plain-looking Edith follows in her father's footsteps: collecting oddities, studying coins, and reading from old books. When Viv rebels against her mother's expectations, Edith finds herself torn between a desire to help her sister and pursuing her own love for a boy who might love her sister more than he loves her. 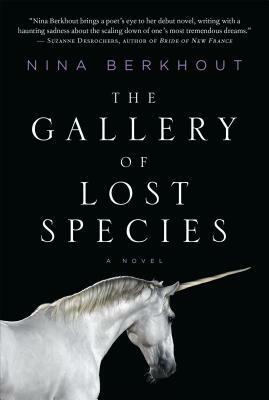 When Edith accepts a job at the National Gallery of Canada, she meets an elderly cryptozoologist named Theo who is searching for a bird many believe to be extinct. Navigating her way through Vivienne's dark landscape while trying to win Liam's heart, Edith develops an unlikely friendship with Theo when she realizes they might have more in common than she imagined; they are both trying to retrieve something that may be impossible to bring back to life. The Gallery of Lost Species is about finding solace in unexpected places - in works of art, in people, and in animals that the world has forgotten. NINA BERKHOUT is the author of five poetry collections, most recently Elseworlds, which received the 2013 Archibald Lampman Award for the year's best poetry. Her earlier work has been shortlisted for THIS magazine's Great Canadian Literary Hunt, The Archibald Lampman Award, and the John Hirsch Award. Originally from Alberta, she now resides in Ontario, where she works at the National Gallery of Canada. This one was ok at best for me. I almost didn't finish it. The family issues in this book just made me think of my own and well I really didn't need a reminder of how messed up my family is lol. The story was a good one but just not for me.